The book “Bamboo: From Green Design to Sustainable Design” by Rebecca Reubens is now on the market and available on Amazon, Flipkart and at stores in India and overseas. Today I got my hands on my own copy inscribed by Rebecca and it is a good feeling to see the seeds sown so many years ago blossom and grow into such a fine offering. Some time ago she asked me to write an Introduction for her book and my note is now part of that product offering as the "Preamble" which I have quoted below. Rebecca Reubens has asked me to write an Introduction for her new book that attempts to bridge three fields that I am deeply interested in and in which I too have been working for a very long time now. The three fields are Design, Bamboo and Sustainability, all of which are extremely complex in their own right and there is little real understanding of the issues and approaches within each of them in the modern world due to a paucity of published research here. Modern design has been around for some time having evolved from its roots in the industrial revolution but it has unfortunately become a form of consumerist expression by industry and the profession and the real human development angle is all but forgotten and we need to rediscover this aspect as a fresh approach. Bamboo is still quite unknown tomodern industry and the design profession although it is a grand old material of traditional societies across Asia and Latin America. Finally, Sustainability has arrived with a bang at the policy level since we are faced with the excesses of industry and governence that has caused both global warming and climate change as well as social unrest which is a product of our selfish ways, all needing a serious rethink and I am happy to see these three issues being addressed here in this book. In the world of traditional societies in Asia, Africa and Latin America there exists a demonstrated deep understanding of all three subjects since these have been used in an evolutionary manner by local communities for many centuries. These continue to exist as a living culture in their rural communities and lifestyles even today but I must say that modern communication and changing aspirations is affecting these towards rapid extinction. Just as our plant and animal species are being depleted by massive modern exploitation of resources these pearls of traditional wisdom are being lost just as rapidly by human neglect. Here I must draw particular attention to the Apa Tani tribes of Arunachal Pradesh who have over many centuries of development in their niche valley in the Eastern Himalayas demonstrated a sustainable lifestyle that is based on the careful cultivation and utilisation of bamboo, timber and an integrated water management system for agriculture that is as yet an unknown value in modern life around the world. Design, on the other hand, is a natural human activity that evolved with man over the ages but it has now has been relegated to the precincts of a professional marketing priesthood that manages the activity in the marketplace of our global economy. Design as it was deeply understood by traditional societies as a broad based human imaginative activity has been relegated to the back burner since we have chosen to follow the specialized path of science and the trained manager since they provide rational answers for everything and modern man and their society can only decide based on explicit knowledge while design in most cases is felt or tacit knowledge and is based on instincts that are better judged by sensitive interpretation rather than by the application of cold logic. This is why I felt compelled to set up my blog titled “Design for India” where I could debate the other dmensions of design that are much needed in India today. Bamboo, has been nurtured by traditional societies across Asia and Latin America and its varied species provide a natural material that had wide spread use in thousands of traditional applications in many parts of Asia, Africa and Latin America where it was abundantly grown but with the arrival of industrial revolution and the spread of Western know-how the dominant materials of our economies started depending on minerals like stone, limestone and cement, metals like steel and copper, synthetics such as plastics and petrochemicals and some economic agricultural commodities such as cotton and jute. Bamboo was therefore neglected by the colonial leaders as the spread of technology and formalized knowledge also meant the reduction of local knowledge in materials that were already in wide and sophisticated use in Asia and Latin America, particularly bamboo which was considered the ‘poor mans timber’ while the emphasis and official attention of the Government in India shifted to timber and wood during the heydays of the British Raj. Sustainability is the hallmark of most settled societies that evolved slowly over thousands of years and gradually built up their lessons of stable and predictable agriculture and lifestyles that were quite in sync with the beat of natures’ processes. However with the arrival of power assisted technologies and communication man could do a lot more and much faster and the race for the dominance of nature commenced in real earnest and each nation tried to outdo the other in their race for global dominance in economy, power and social well being, all measured by growth and growth alone. However, the destruction of pristine rain forests in search for minerals and material wealth and the release of toxic gasses into the atmosphere has had its natural consequences and we are on the threshold of rediscovering the concept of sustainability in the face of the threat of human extinction, a threat that is imminent, if corrective strategies are not adopted by the worlds citizens and their political leaders on a most urgent basis. Sustainability is then a call for a return to a steady-state economy that echoes nature in all its involved and intertwined processes. This impending crisis places this particular manuscript at the centre of the debate where all three subjects can play a meaningful role and in trying to address and bridge these three difficult but critical fields that promise to bring long term benefits that can counter the problems of our uncontrolled developments of the past few hundred years. Design strategies will need to be explored and design itself will need to be understood and applied by political leadership across the world along with the subjects of science, technology and management and design at a deep level will play a huge role in the reversal of global warming and the move towards sustainability in the days ahead. Bamboo is the fastest growing plant material known to man and we will need to learn to use it in new and improved ways to supplement our vast needs for materials across many areas of application and much research would be needed to fill the gaps in our knowledge along with an urgent attempt to codify and garner the traditional wisdom that still exists across the bamboo culture zones of the world, particularly in Asia and Latin America. Sustainability too is a subject of current scientific and political interest and there is much that we need to understand about the symbiotic processes that live and work in nature and then be able to use this understanding back into our own ways of living and doing things in the future. 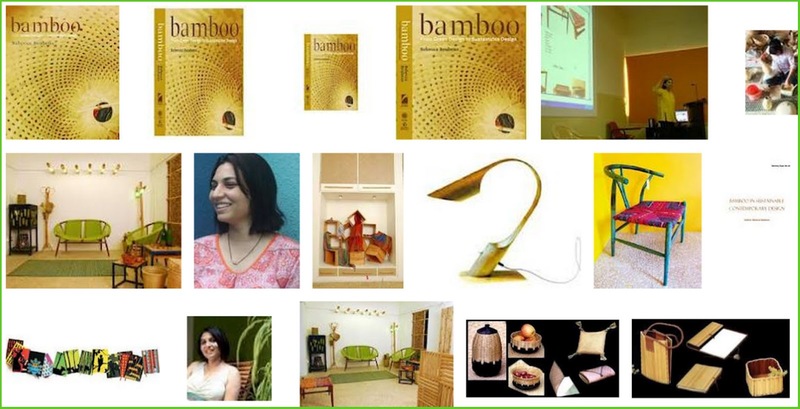 This manuscript, “Bamboo: From Green Design to Sustainable Design” by Rebecca Reubens stands as a brave attempt to bridge the huge gap and I am sure it will encourage others to follow in the much needed integrative research and design actions that is needed in the days ahead. Rebecca studied design at National Institute of Fashion Technology (NIFT) and then joined National Institute of Design (NID) in the Furniture Design discipline where I used to trach teach till I retired in 2010. She started her own journey into bamboo when she took on the subject as her Diploma Project as a student of Furniture Design at NID. We had a challenging project handy as part of the Bamboo & Cane Development Institute (BCDI)project that I was heading in 2001 and she has stayed with the subject and journeyed far as a member of the International Network of Bamboo & Rattan (INBAR) field team and now she has taken it on as her subject for her PhD Thesis at TU Delft in Design and Sustainability through the medium of Bamboo. She also went on to set up her own enterprise to work with local communities in Gujarat and from this to learn the significance of human effort at the grassroots using Design, Bamboo and Sustainability as her driving principles and to learn from this experience that which is not yet stated in any book so far, lessons from real life experiences from the field. All three much needed today and I wish her success. Image01: Models and lectures that were developed over the years for the Design Concepts and Concerns course at NID as they stood in 2005 as they appear in the EAD06 conference presentation at Bremen, Germany. In 2009, Meena Kadri wrote about the course on her blog, “Random Specific”, and she sent me a link with a question – “Has not the DCC course evolved at NID over the past 40 years or so?” I sent her a brief note and then decided that the question could be answered at some length and perhaps some design historian or research scholar would be sufficiently interested in looking at the evolution of the pedagogy at NID which I do believe has made significant contribution to design education in India as well as in the world, much of which is as yet not appreciated due to a paucity of published references on the processes and personalities involved. Parts of this post appeared previously in July 2009 on my course blog named after the course – Design Concepts and Concerns – and here I am elaborating that post with reflections on what has happened after my retirement from NID and the directions that are being explored today by the institute and its faculty. Image02: Cover and contents page of the Design Issues journal of Autumn 2005 dealing with Design and education in India. The course as it stood then is documented at this blog site and through a couple of papers that I had written, first in 2002, specifically for the Design Issues magazine at the invitation of Martha Scotford who acting as a guest editor was compiling a collection of papers about design from India for the Design Issues magazine's volume on India. However, this paper that I wrote and submitted was called the "Avalanche Effect" and as luck would have it was not included in the final edited version, unfortunately. On Mon, 1 Dec 2003, after a long wait to hear from the editors I finally received a message from Martha Scotford about the rejection of my paper and I was at that time teaching at the BCDI in Agartala and I immediately posted the full text of my paper on the PhD-Design list which can be seen at this link here below: Avalanche Effect on the PhD –Design discussion list. The Design Issues is a very respected peer reviewed journal from the MIT and the reviewers may have thought that the claims made by an unknown professor from India were a very tall order at that time or found some other shortcoming in my paper based on which it was declined. The journal came out with their volume about India and Indian design and this did not include my paper (“Design Issues: History Theory Criticism” volume 21, Number 4, Autumn 2005) The pdf copy of the “Avalanche Effect” paper can be downloaded from here as a 55kb pdf file. Image03: Select pages from my presentation titled “Creating the Unknowable” showing the series of Assignments that are offered to NID Foundation students as part of their five week course on Design Concepts and Concerns. However in the same year, in 2005, I wrore another paper about this course and my paper was titled “Creating the Unknowable: Designing the Future in Education” and this was also about the DCC course and it was accepted for a peer reviewed conference at Bremen Germany, the EAD06 coordinated by Wolfgang Jonas a design thinker at the Bremen University School of Design and I was able to share the DCC pedagogy and the underlying intentions for the first time on a public forum composed of critical design professors. (Download the full presentation from here as a 54MB zip file containing one pdf of the presentation and six linked movies inside one folder) Unfortunately, even here I faced problems of support from my own Institute. My travel costs would not be supported by NID authorities even though I was going to present a major course development done at the school over many years of experimentation and I had to bear the cost of travel myself. This does show how difficult it is to get support for design education in India in all these years when design thinking was being explored and refined through our teaching and design explorations, without much official support from the authorities that be. This lack of official support is captured in the title of my conference paper for the first National Design Summit in India called the CII-NID Design Summit that was held in Bangalore in December 2001. My paper was titled “Cactus Flower blooms in a Desert: Reflections on Design and Innovation in India”. Download that paper and the accompanying visual presentation from here as a 14.5 MB zip file containing three pdf files. Image04: Thumbnails of OHP sheets used for the DCC course lectures in the late 80’s and early 90’s before the course was changed significantly in 1998. Yes, to cut a long story short, the course dealing with design theory and design thinking has been evolving at NID for many many years from the original “Design Methods” that was first taught in its imported and refined form by Prof Kumar Vyas from the late 60’s and the early 70's for Product Design and then in the Foundation Programme and he was later assisted by Prof S Balaram and assisted by the young Dhimant Panchal. 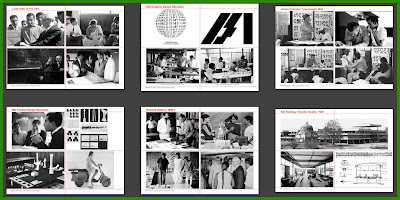 A variation in its title took place when the teachers of this course at NID started looking at processes within design in the 80's and it was then re-christened and called “Design Process”. A version of the course offered to Product Design students at the AEP Level was called “Product Design Process” and each discipline at NID had their own version of design theory being offered under different titles. 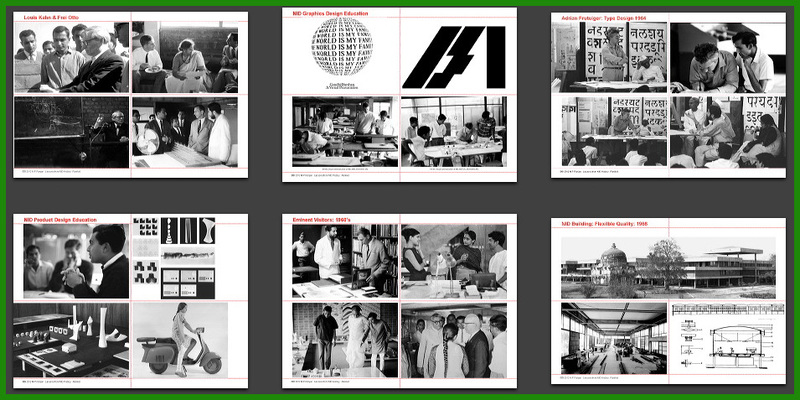 In the mid 70's Prof Mohan Bhandari took over the Foundation programme after his stint of study and work experience in Germany with Professor Herbert Lindinger, a former faculty of the HfG Ulm, and he brought in the Environmental focus to the whole Foundation Programme but this course was still called "Design Process" and that was the case when I took over this course after his departure from NID in the late 80's. Christopher Alexander’s papers and in particular his descriptive pages from his “Notes of the Synthesis of Form” were available at NID as cyclostyled papers, in a number of copies that were freely available on campus, which I had seen and I even had a personal copy way back in 1969 when I joined the Institute as a student in the first Post Graduate Programme in Furniture Design. These may have been here of many years before Prof Vyas’s course offerings and Alexander did visit India in the early 60’s as part of his research efforts for his first book that looked at an Indian Village as a source of inspiration for his theory about human settlements and design. It was only much later that I could understand the significance of Alexanders research since the Indian village held lessons of human evolution in an almost uninterupted manner in the Indo-Gangetic plains, a continuous evolution of over 5000 years that may not be found anywhere else on the planet. The cyclostyled papers could have been an early draft of his book which someone may have collected and shared with all of us in NID, I hope we get to know this background in some detail when the research about NID is conducted in some depth. There is however an official history of NID in the making and the deadline for its release has come and gone but there is still no sign of the book which has been a closely guarded secret even from members of the NID faculty who are not part of the inner circle of researchers on that project. The book - 50 Years of NID History – was "released" at the NID Convocation ceremony in December 2011 by the the then Chairman of the institute's Governiong Council, Salman Haider, as part of the Golden Jubilee launch but I am told that this was a dummy copy and a symbolic launch – very sly and a slight of hand; just to keep up promises made earlier - very disappointing indeed. I hope the book sees the light of day and we get to see it sometime soon. 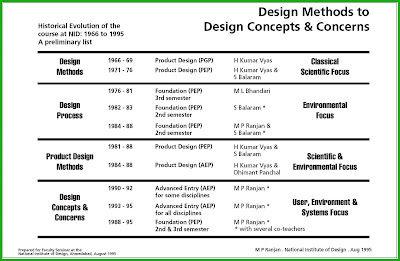 Image05: Chart showing the evolution of the Design Methods and Design Process course in the 60’s and 70’s leading up to the formation of the Design Concepts and Concerns course in the 90’s. In the mid 90's we changed the name of the course and called it “Design Concepts and Concerns” to bring focus to the broader issues that underpinned design action and learning. Some of us realised that ethical and value concerns and motivation with personal commitment are just as important as the tools and processes that designers use to address complex issues and derive suitable design offerings that could be the foundation for responsible design. This is a very brief statement on a long and involved process of course evolution at NID and that paper is still to be written. Many teachers worked with me from 1988 onwards. First it was Jatin Bhatt and Sangita Shroff who then went on to join NIFT. We then had Rashmi Korjan for a long time and Suchitra Sheth and Laxmi Murthy for a brief interlude. Since 1998 many teachers audited or assisted in the conduct of the course either partly or with full involvement and these include Alaxender Bosniak who now teaches in Germany, Dimple Soni, Meena Kadri, Bhavin Kotari, Harini Chandrasekhar, Bani Singh who teaches at NIFT Bangalore and many more that I will have to recall a long list of former students and faculty colleagues if the list is to be completed. Others on the faculty included Praveen Nahar, Ramakrishna Rao and Gayatri Menon in later years. In Bangalore, C S Susanth and Jignesh Khakhar, joined the course last year and we also had a senior student helping us in 2008 from the SDM discipline, Anand Saboo and so on. Many other senior students used to come in and hang out while the lectures and presentations were in progress and there was a rich discussion both inside as well as outside the course on the subjects being explored within the course each year since we had big themes and macro-economic concerns that were addressed, debated, brainstormed, modeled and mapped by each batch and each class producing a rich crop of design opportunities that were represented as visual scenarios that stayed in the mind for a very long time as a vision that cannot be shed easily, once it is found. Design thoughts and insights are not easy to forget if they are appropriately visualised. 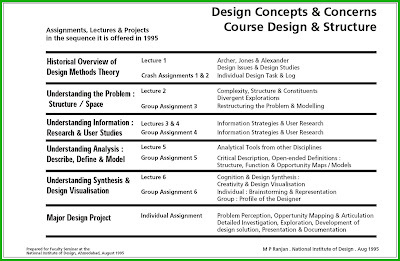 Image06: Table showing the course structure and contents in 1995 when I had used this image to share the development of the Design Concepts and Concerns course in a presentation to the NID Faculty Forum as part of a course critique at NID in those days. I purchased a SONY digital camera in 1998, my first really expensive buy, and the first one freely available at the institute and I used it to record all our classes in great detail. 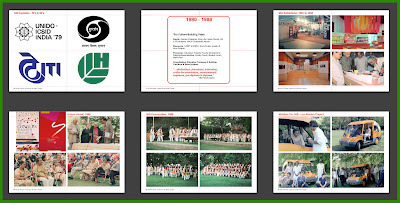 I have shared detailed digital pictures of the student assignments done during the course from 1998 onwards and developed the use of digital images as a source of extended memory for the students to revisit their experiences during the course. These images were shared with all students in individual CD-ROMs, one for each student to take away and when the NID server was set up these images were made available to the whole institute without any editing. 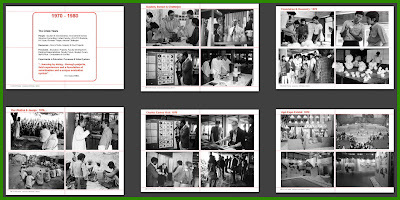 Besides this sharing of images, there are many xerox documents in the NID Library of selected student notes and project documents from the earlier phase (from 1988 to 1998) that may need to be revisited. In that early phase we did project based assignments that were assigned to individual students and this was after a phase of lectures and group assignments about design concepts and methods and these projects were done by individual students and that called for individual guides which we fondly called the OPD (out patient department) and here we had Pradyumna Vyas, Vinod Parmar, S M Shah, P M Choksi, S Balaram and several others as project guides for the foundation students as part of the Design process course from 1988 to about 1998 when I dropped the individual project since it was becoming a ritual and not really contributing to any form of deep understanding in the student. The teachers who were guiding the students did not really contribute to a better understanding of the design thinking dimensions but were instead, I realised, focussed on getting the students to deliver great solutions rather than them learning about the nature of design itself as the core activity and the aim of the project. From here on the course became more team oriented rather than individual focused and group processes and group grades became the norm much to the dismay of the Academic Administration, since I refused to give individual grades. Shown above in Image04 are picture of an OHP sheet that I had used in 1995 to describe the design process and this is available for download as a pdf that gives the shift in content and assignments as it stood in that year which can be downloaded from here – Download OHP Sheets used in 1995 as pdf file - these are based on hand drawn OHP sheets that were used from 1988 onwards. 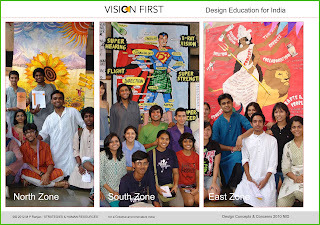 On 15 August 2007 I had made a post on my other blog “Design for India” about this course and we have another description of the course and its intentions and effects at the link below: Design for India – Post on the DCC course. By 2002 the course was accepted for both the under-graduate foundation programme as a core offering as well as for all Post Graduate courses offered at the Institute. We started offering this course at NID Gandhinagar campus for the new disciplines of New Media, User Interface Design as well as for the Strategic Design Management students there. When the NID Bangalore campus was set up for three new disciplines this course was offered there as well and these are documented at each offering on the DCC Blog for those who may be interested in the details of what were the themes and the work done by the student teams – all documented in some detail there. 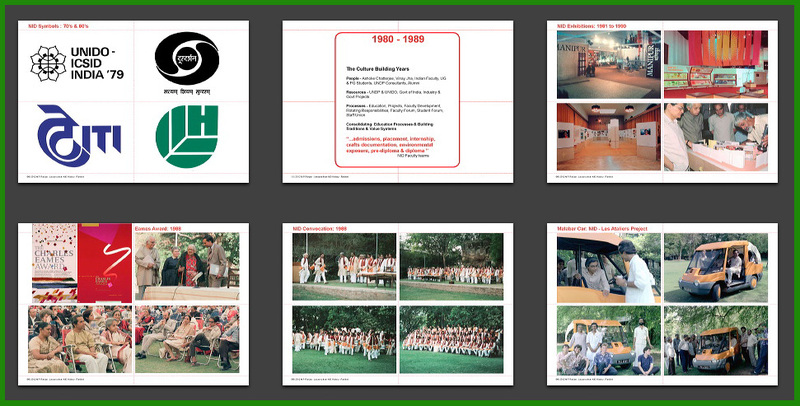 I offered this course at NID till November 2010 when I retired from being a faculty at the NID. Last year the course was offered to all batches of students at NID in much the same way that it was designed and developed over the years. However this year I am told that the curriculum review process has decided to drop the course and to adopt the older name of design methods so that the teachers at NID could focus on teaching tools and techniques of design research and not get confused by the macro issues that have been the hallmark of this course since it was revised in the late 90's. The argument, I am told, is that foundation students may not be mature enough to address the complexities of the real world at the early stage in their education that and these would be better reserved for a later stage in their education at NID. Is NID education reverting to the design paradigm of the 80's? Only time will tell!! When the Government of India announced the setting up of four new NID's in different regions of India it set alarm bells ringing amongst a group of NID alumni who expressed deep concern on the social networks and discussion forums in India. Almost organically a group came into existence and it was called the "Vision First" initiative. It so happened that all members of this group were NID alumni and they took up issues with Government and called for a national debate and discourse on whether the same model of the old NID at Paldi would be followed for all these schools or should we have a fresh think about where design is heading and this debate is documented in some detail at the blog set up by the group here –Vision First – a call for new design initiatives for India by a group of very concerned design professionals and academics from India. I do hope that both NID as well as the Government of India will listen to the voices from these design activists who have had varied experiences in design for development right here in India. Design Thinking and its application is indeed gaining greater acceptance in India as well as overseas. Management schools and research agencies are beginning to use design thinking to address complex problems and to search for solutions to products, services and systems that make up our lives. Governments too are looking towards design and we will need to build capacity to respond to these kinds of opportunities besides the traditional capability of giving aesthetic form to products of industry and to create marketing messages for commercial ventures in the form of advertising and business communications. I have written about these areas and more needs to be articulated here. Some of my previous posts are listed here for easy access in the context of why the DCC course is important to nurture and take forward as it has been evolving at NID over the years. 2007 October - Design Thinking: What is it? 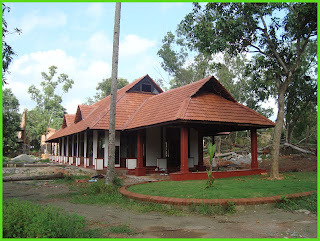 Besides these posts from my Design for India blog here below I have linked several posts on the Design Concepts and Concerns blog that deal with the theory associated with this course. The world of design and design education is moving inthe direction that we had anticipated in the DCC course at NID and we now see evidence of this is the new publications that are emerging from the West. I will draw attention here to one particular recent book that is available online with a good and interesting business model that makes it very accessible for our design students in India due to its attractive pricing policy for the digital version. The book that I refer to is "Wicked Problems: Problems Worth Solving " by Jon Kolko, Austin Centre for Design, 2012 and it is a recent example of the emerging expanded approach to design thinking that is being explored and shared. Returning to the idea of the "Avalanche Effect" and the claims that I have been making over the years in my papers and presentations about this course needs to be revisited and validated. I took over from Mohan Bhandari in 1988 and I remember that Kiran Bir Sethi was in my early class and her document of the course and her design project are preserved in the NID library as a xerox document that I had placed there for posterity along with others over the years. Her "Design Process" project was on Design Education and there is no surprise for me that she is today running a school in Ahmedabad called Riverside School that uses design thinking as a core for delivering the school curriculum and she is also the author of the world's biggest design education effort, Design for Change Project, with millions of children being introduced to design thinking at the school level. I call this phenomenon the "Avalanche Effect" and I see this happening all the time in design schools that encourage its students to think big and connect with the real world and address real problems and opportunities in the real world. 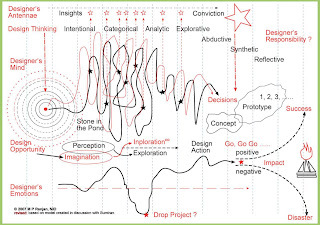 The Design Journey model was sketched out 2007 based on a conversation with one of my former students, Sumiran Pandya who came into my office at NID to seek some clarifications on the complexities of design thought and action. Sitting face to face with him, I had a blank sheet of A4 size paper in front of me and as I spoke I doodled the map and filled in terms and stars as we progressed with the discussion. The design journey is explained through a metaphor of a “Stone in the Pond” when the initial intention is without much depth or definition but with a sense of what we would like to achieve, a direction, just like the first contact of the stone in the pond and then the ripples move out in ever growing circles till they reach the edges of the pond to return as waves that would also capture the contours of the lake as well. In this model the journey is represented by two sets of co-located and forward moving lines, one red and the other black. The red line represents the state on mind and mental processes while the black line the state of the body as well as bodily sensations that closely coexist as we continue our journey of search, experiment, seeking and discovery as well as small and major insights that occur as we tend to engage with different aspects of the domain that is being examined and explored. These insights are represented in the stars that are marked on both the red as well as the black line since some insights are mental constructs while others may be bodily sensations that can have a tacit existence but may not be articulated in thoughts and in language easily. This journey is represented by the meandering paths in red and black shown in the middle of the page as emanating from the centre of the pond ripple. This is a sort of plan or aerial view of the journey or a map of the terrain that has been traversed as the design explorations progress. Just below that representation is another path that represents the emotional status of the designer or design team, which is represented as a horizontal line moving in sync with the mind-body journey path in real time. This view is like an elevation view from an orthographic diagram and each point on this line would correspond to a particular point on the mind-body line represented above. The emotional journey also meanders up and down with hopes rising and some times soaring with the arrival of new insights or breakthroughs and at other times dropping down to a pit of frustration and utter dejection at times that could even lead to the project being abandoned for some time or altogether if there are no mentors present who could hand-hold and help the designer move forward and find future satisfaction or success. In some cases there could be a long gap between one stage and the next and many such breaks before final success is achieved, if at all. There are no guarantees in this activity and the designer needs to develop an attitude that can cope with ambiguity as well as cope with a lot of failure before a major breakthrough is achieved. 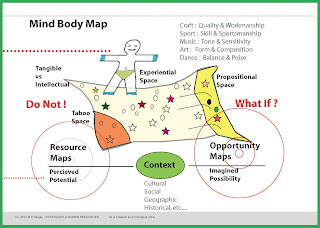 Design thinking is for me a form of embodied thinking when many particular thoughts are connected to some sense data that is carried in the body as a perception or even an unarticulated feeling that hovers over the body whenever that particular thought is accessed. This tells me that perception and imagination are intricately connected and they move forward in sync as we explore and develop design opportunities in search of viable design solutions and concepts. The process by which these design opportunities are developed would happen in the mind and body space, with real world explorations supported and enhanced by imaginations that I call inplorations for want of a better word. Inplorations have both mind and body characteristics since each held image would have both an imagined form as well as a felt feel. The softness of feathers and the hardness of stone are carried from our real world experiences to our imagined construct and these can be processed just as they can be experimentally explored in the real world. These explorations – inploration loops develop as design actions and these leave behind a huge body of intermediate products and by-products that are a result of both exploration and inploration alike. Concepts as well as discarded ideas are strewn along the design journey and very few designers pay heed to these by-products and rarely are these documented in the rust to find the final solution. For me these intermediate stages and its by-products such as doodles, sketches, mock-up models and draft prototypes all have great value in my research for understanding the design process in all its complexity. Similarly many imaginary by-products and sensations are carried in the mind for long periods of time before these are finally achieved in the real world constructs and the delivered products and services that the designers approves. These imaginary by-products also play a role in conceptual blends that will see several of these imaginary constructs being combined and modified before a few of these imagined alternatives are tested in real material at a huge cost of time and effort. The mental constructs take fractions of seconds to synthesize but their material counterparts may take years to accomplish. This diagram tells me something about the nature of design opportunities, which explains why it is so difficult to explain your concept to a colleague or to a client since part of the attributes are lying in this imagined space and cannot be felt or seen by the viewer. This is an experiential part and in some cases future projections of scenarios of the idea that can be seen vividly in our minds eye quite clearly but are nor apparent to the viewer even if they are explained in great depth, the imagination that may be generated in such a dialogue with the viewer is that of the viewer and not of the designer, there is a mismatch. Design is not about the general principle but about the particular manifestation, which generates value, great value, and in most cases true value resides in the ultimate particular and not in the general concept at all. This is my grandfather’s chair and not just any old chair!! Very valuable, for me. 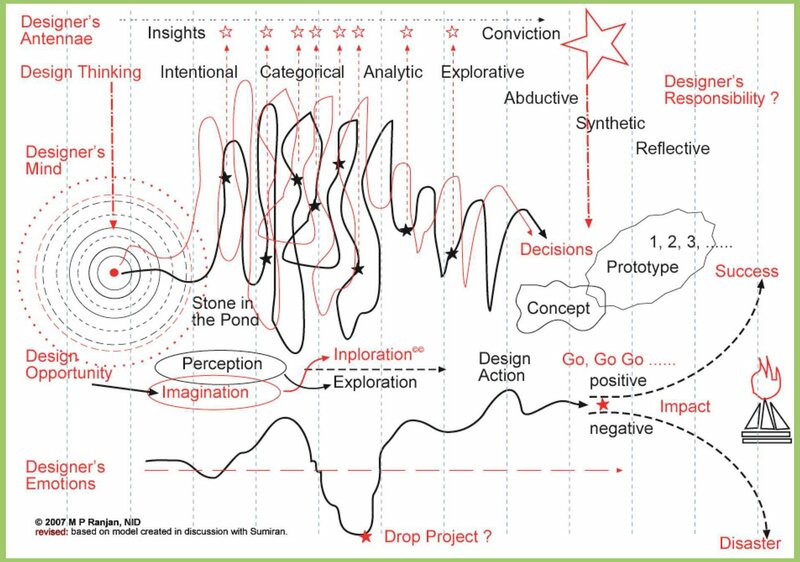 The insights that are garnered and assimilated in the conscious mind are shown as star points on the design journey map. These are harvested from all our experiences and gathered together as a string of such insight stars along the way and as they accumulate above in the mind and in our guts as favored thought sensations and feelings and these familiar ones contribute to the forming of deep convictions that are finally represented as a big star from which decisions are empowered and supported. Design thinking also goes through many styles of thought or modes of thought and each is used typically at a different stage in the design journey. These modes of thought are quite distinct and each has their own mind set and associated attitude. These are described in some detail in my paper titled “Design Journey: Styles and modes of thought and action in design” and on my blog at this link here. This process moves from intentional thoughts through categorical, explorative and analytic modes to arrive at abductive, synthetic and reflective modes at different stages of the design journey and some modes are returned to as we move forward in iterative steps along the journey and revisit and verify earlier concepts and refine and elaborate some of these as we go forward in our search for a suitable fit to the problem or opportunity at hand or should I say in the mind of the designer. This also brings up for me the role of the designer and his responsibility in the whole process since only he can see parts of the scenario and some scenarios are so problematic it may be possible that these are held in abeyance as a result of their potential consequences. In any case the designer has no control of the concept once it arrives in the real world as a prototype or even as a sketch manifestation since these are available for others to act upon and that is what makes design process a reflexive journey since others immediately respond and act on their own capacity in the face of a new design offering that may challenge their comfort or their position of strength in a competitive business environment. The response is usually immediate and in some cases even pre-emptive and the design offering fails to muster support since it is doomed by the consequences of the marketplace. There is no guarantee for success and even if a product or service is launched the success may only be seen in the market and not be tested in any lab or closed loop jury of peers and experts as all of them could be found lacking in foresight and prediction of what the market would actually support. The last part of the diagram shows us that once the design offering is out of the designers grasp it enters into an orbit of its own that is determined by market forces and the real world complexities of social and political forces as well as economics, biases and taboos so that we cannot predict the outcomes and it could be a rearing success or an unmitigated disaster, as in global warming that is a consequence of many of our very thoughtful and so called successful design actions of the past. This is why such sensibilities are critical for a designer to hold and cherish and his ability to weigh these variables and concerns may be the answer for warding off future disasters. The designers thought processes are not unhindered nor are they uninhibited by his taboos and biases, we are after all human. This is what I tried to depict in the model of the mind-body map that I had developed to explain the process of innovation and design in exploring future possibilities and in addressing known and deeply held beliefs that may need to be processed before we are able to make a break-through that would show new and improved way of acting on our world and to try and improve what and how we do things in our world in the days ahead. Once we are aware of ourselves and our taboos we may be able to see “What if” and “What may be” which are fundamental to making new combinations that can be offered as possible opportunities on the design journey. 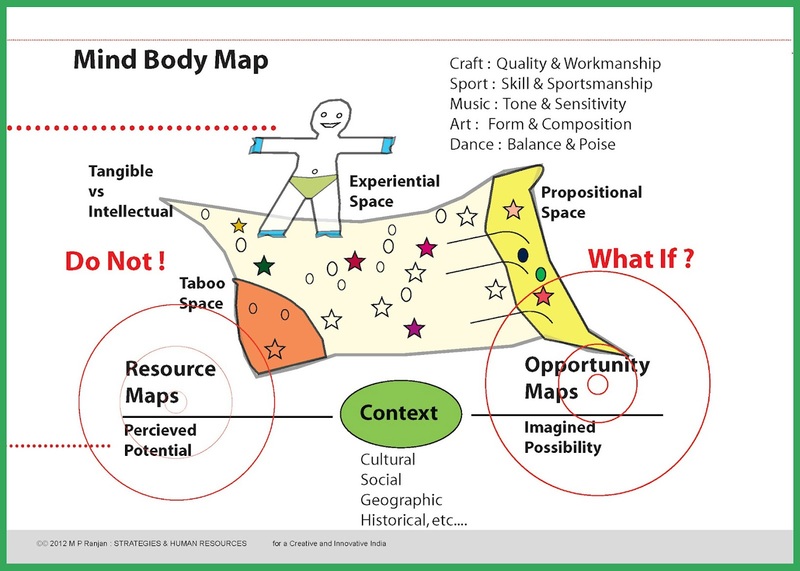 This model of Mind-Body map shows me that the resource maps that we are able to generate are inclusive only when we are able to transcend our taboos and discover resources that may otherwise be invisible to us when seen through the filters of our biases and socio-cultural taboos. Similarly imagined opportunities get processed through the design journey to bring back reformed design offerings that are synthesized and developed in such a way that they vibe with the context and add value to the social, geographic and historical situation that is being addressed. Value emerges when the combination of possibilities are fine tuned to the ultimate particular offering where the variables are in fine balance and there is a display of great value and an unfolding of value that is not measured in small quantities but in huge steps and in some cases quite disproportionate to the inputs that have been deployed. Cost has no relation to price and material has no relation to value, if the experience is wonderful that user is charmed and the offering is of immense value. It is My Grandfather’s chair!! Therefore it is not necessary for a great design to be a novelty for it to generate value but its particular manifestation may have the ingredients of immense value and part of that value comes from the viewer and not necessarily from the object or service that is being offered, the context matters just as much. In this model I divide the mind space or canvas into three distinct zones, the Experential space, the Taboo space and the Propositional space. The Experintial space has all the collection of past experiences and memories including sensations that are linked to particular memories as an embodied memory and these are very critical for design thinking. These could include surface qualities experienced by touch, taste or smell when a material is handled or strength that is experienced in our guts when we bend a piece of material in the hands while examining its suitability for a particular application while the design task progresses. 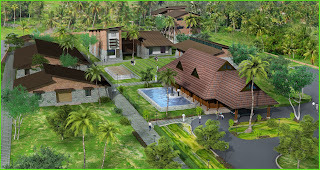 Designers touch materials all the time and file away insights about many of its qualities and these come memories flooding back when called upon to make a decision about making new choices while the design thought is in progress. The Propositional space is where we file away tentative models and diagrams of patterns that could resolve or partly develop design ideas and these are works in progress and can have many internal ideas generated through the proces of "inploration" that I have mentioned above. Conceptual blending is used to create many layers of alternatives and existing concepts and combined with new ones to make an array of alternatives from which informed choices are made. The Taboo space is also important and this is the blind spot of the designer and it influences the resource may since the taboos that the designer carries from childhood or from social and cultural practices may or may not permit them from even seeing available options since they may be a taboo subject in their culture or in their personal experience. Fear, beliefs and dogma all play a role and to overcome these is a huge effort especially if orthodox practices have been deeply ingrained in the designers mind. The 'flying magic carpet' in the model can be seen as that of the mind being compared to an infinite canvas or supple fabric with each star or dot representing one or a collection of memories in chunks that can be brought together as Shibori or Bhandani workers bring together knots in their fabric to dye a particular colour in the process of pattern making on cloth using the tie-dye process of patterning. While the tye-dye process take time to tie and form patterns the mind takes no time at all, or almost no time and at a heightened state of creative excitement we can do millions of such comparisons in a very brief period of time. Yes, motivation is important and the spirit must contribute to experience and skill. Responsible design is another factor that plays an important role in value formation but that may be the subject of another post. The body and mind are intricately connected and these provide us the embodied experiences that are critical for efective design thought and action. * Falling out with Chairman Governing Council and trial by media. * UNIDO-ICSID conference on Design for Development – New Ideological perspectives for Design education to look at neglected sectors and new areas of application. * Akhil Succenna appointed as Acting Director. 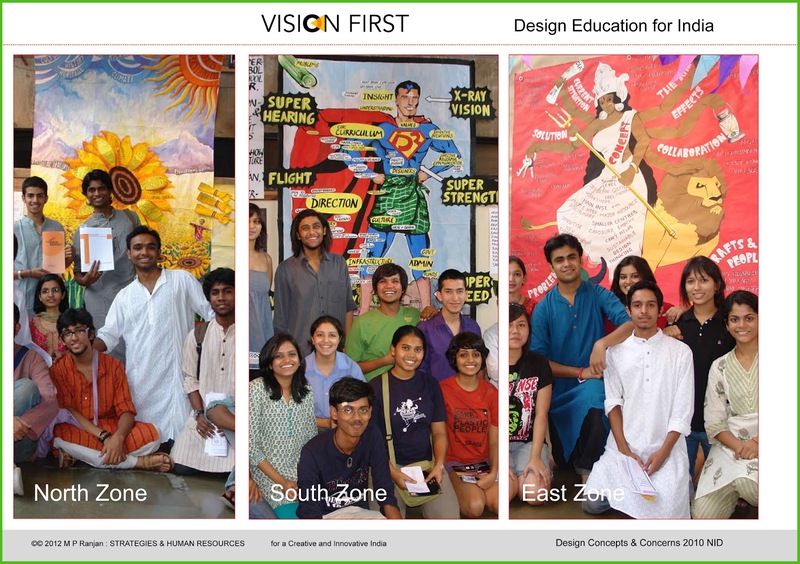 * India Design Council Launched and new programmes for design promotion announced. 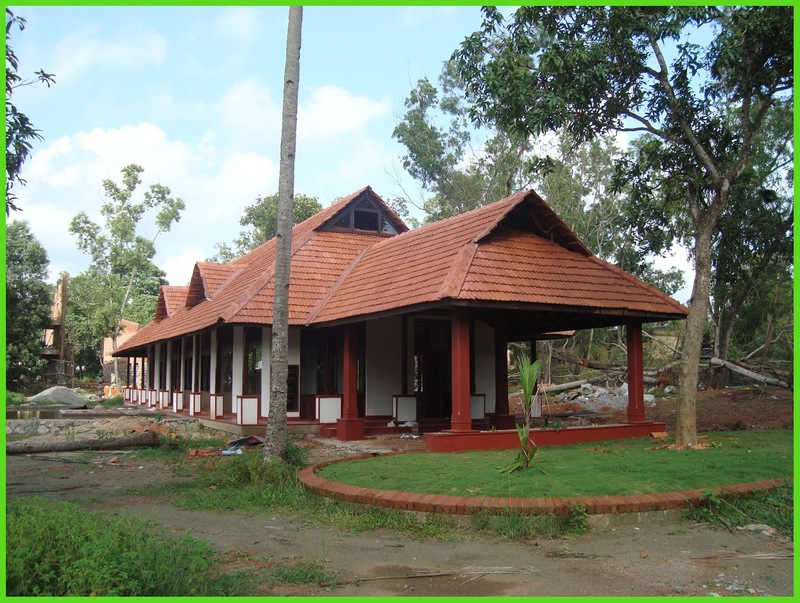 * Railway Minister allots Rs 10 Crores for a Railway Design Centre at NID campus in March 2012 budget speech. “Power cannot be delegated, it can only be assumed” Ravi J Matthai.